Inspired by David Grossman’s book, I found myself in this quote with my personal meaning of it. I imagined myself without a face, just like a sort of disused mannequin. The face is only a shadow covered by a veil with a big moth, a symbol important to me, and my hand push a knife into a heart-shaped ballon… my real heart, reduced to a simulacrum, so fragile and squeezed that with a little effort it could explode. That’s how anxiety made me feel after facing grief and family’s losts. As Sylvia Plath, I saw my life branching out too: choices, events, changes… things that made me feel happy or terrified. 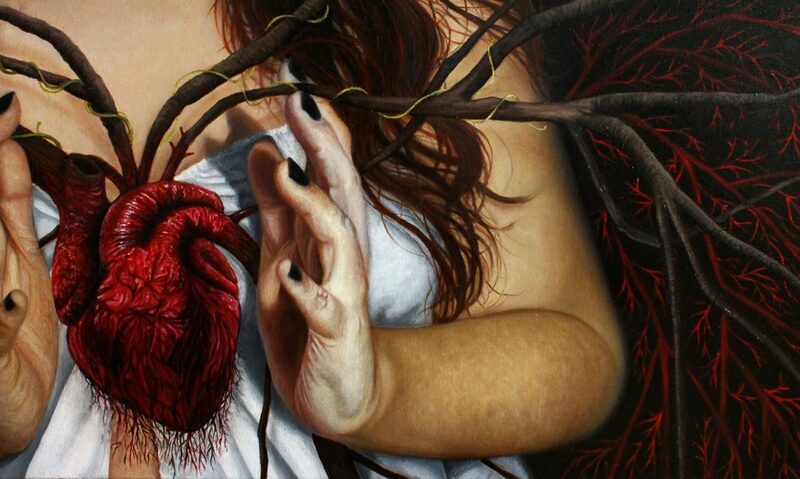 The heart, my heart, is branching, creating wood branches and red veins and capillaires on the background. Every branch could represent a path in the life, an endless range of different choices and goals. The heart has also roots, bloody and broken roots, that represent the base of a human’s life: people we love, our memories, things that made us as we are. They’re broken and bloody because people leave or die, all of a sudden. But from the same dead roots are borning new shy and little buds, source of hope and life. This painting is a visionary childhood fear: as children we used to play hide-and-seek, we shut our eyes, counting while the other children were hiding theirselves, then we opened our eyes and everybody has disappeared, we’re alone now in darkness and silence. I felt a connection with this same feeling in life: I’m a child, a free, light-hearted and lucky little girl, surrounded by all the people I love the most. I call them “the pillars of my soul”: my soul is a temple and they’re the decorated strong pillars who support it and make it stand. I’m closing my eyes and when I lift my lids I’m an adult facing the uncontrollable flow of time, the loses of my beloved ones, the resignation in my eyes and the temple’s crash. This is the rough awareness that we all are just human. This painting is not available, a similar work could be done on commission. This painting, “The Waves”, is inspired to Virginia Woolf and her famous work, one of the most fascinating women in the world, according to me. Before the latest version, she wanted to entitle her book “The Moths” because she was obsessed by them in the writing process, symbols of precarious but tough life. I feel the same about the moths, they’re one of the most recurrent symbols in my artworks, and since I was a child they represent for me a sort of “guide spirits”, they appear to me every time something has to happen or change. An antique popular belief wants the nocturnal butteflies be the spirits of our dead beloved ones who visit us and we have to accompany them through the window to let them live another life. I don’t know what’s the truth but I always found them fascinating, mysterious and beautiful. Many artists of all times investigated and represented the thematic of “Vanitas”, the ephemerality and caducity of life with some symbols, like the skull, who remind it to us. This is my personal vision of the same theme. All the following paintings are inspired by the omonym books.